Despite being vastly outnumbered, reformers made a real difference. After three years, multiple missed deadlines, and at least 111 meetings between regulators and Wall Street groups (versus only eighteen meetings with pro-reform groups), we finally have a final version of the Volcker Rule—and if properly enforced, it will change the business of banking for the better. The Volcker Rule aims to ensure that banks that enjoy the backing of the federal government and the cushion of customer deposits do not get to make risky bets (or, in the language of the rule, “proprietary trades”). In other words, banks that have a taxpayer-provided parachute don’t get to BASE jump off of mountains for the thrill (and profit) of it. It was a long path to get here: Senators Jeff Merkley and Carl Levin authored the law in 2010, as a part of the Dodd-Frank Act. Financial regulators were responsible for writing the final rule. A draft was published in 2011, and 18,000 comment letters were written, the vast majority by Wall Street interests. But reformers also wrote letters, including Americans for Financial Reform, Better Markets, Public Citizen and a letter from the group “Occupy the SEC” that I co-authored. Despite being vastly outnumbered, reformers made a real difference: the final rule rejected many of the additional exemptions banks wanted, and it is stronger than the draft in many key places. In the original law, Congress sought to preserve banks’ ability to trade with clients (called “market making” on Wall Street), as well as their ability to hedge their risk, which is the way banks try to protect themselves from staggering losses. But many feared these allowances for market making and hedging could be abused. As I previously pointed out in The Nation, the London Whale trading fiasco highlighted an enormous loophole in the rule for “portfolio hedging.” This blanket loophole could have allowed banks to continue their proprietary trading unimpeded. Not only is portfolio hedging gone, the hedging exemption overall has been significantly strengthened. Banks now have to outline ahead of time specifically what kinds of trades would be appropriate hedges and show that they demonstrably reduce risk—an extremely positive step. For these improvements, we undoubtedly owe a debt of thanks to new SEC Commissioner Kara Stein—who insisted that the hedging exemption was too broad—and to CFTC commissioners Gary Gensler and Bart Chilton who also advocated for strengthening this provision. Without their efforts, this rule would undoubtedly have been weaker. In the final rule, banks’ trading will be monitored at the level of an individual trading desk—which is common sense, since that is the level at which all trades are made. But many banks requested the monitoring happen one or more levels higher than that—a step that would have made the rule easier to evade. In explaining their decision to look only at the trading desk and not a higher level “organizational unit,” regulators cited concerns outlined in the Occupy the SEC comment letter (see the rule’s preamble, footnote 703). The final rule requires CEOs to attest that policies exist to ensure that there’s no proprietary trading. Regulators could have gone farther, requiring CEOs to attest outright that there is no proprietary trading at their bank. That they chose a less aggressive tack is unfortunate, but the fact that this CEO attestation exists at all is a small step towards changing the culture of risk-taking on Wall Street. Banks must now provide extensive documentation to regulators, including reporting lines, risk limits and the types of trades each desk will make. Banks should be compiling this information anyway. But providing this information to regulators should enable them to spot evasions of the rule. Regulators must make this documentation as public as possible—including things like delayed or aggregate trade information. Moreover, the public should pay close attention to qualitative things to see if the rule is working. For example, the skillset of a proprietary trader is totally different than that of a market marker. A huge amount of trading on so-called market making desks, prior to the Volcker Rule, has been proprietary trading. If this rule is working and not being evaded, we should see some movement of staff (those traders that live for making risky bets) from banks to hedge funds. Toss-up: No Bank-to-Bank Market-Making… Unless! One ostensible win for reformers was the clarification that banks cannot consider other megabanks “clients” for the purposes of market-making (when the other bank has $50 billion or more in trading assets and liabilities). This is important because megabanks typically only trade with each other for two reasons: to hedge, or to proprietary trade. Goldman Sachs is a competitor, not a client, of Morgan Stanley, so this clarification makes good sense. Unfortunately, there are two exceptions. Goldman Sachs can consider Morgan Stanley a client, and thus be exempt from the ban on proprietary trading, if Goldman documents why Morgan should be treated as a client. The rule does not specify exactly when that is acceptable, so regulators will need to scrutinize such documentation to ensure banks don’t abuse this exception. Toss-up: How Anonymous Is Anonymous? The second exception is when two banks trade “anonymously on an exchange or a similar trading facility.” Regulators must clarify what they mean by a “similar trading facility.” Much bank-to-bank trading occurs through “inter-dealer brokers”: intermediaries that allow two banks to trade anonymously (who is on the other side is revealed when the deal is done). If interdealer broker phone trades can constitute “anonymous trading activity,” virtually no bank-to-bank trades will be prohibited, significantly weakening the rule’s effectiveness. In order to prevent banks from simply shifting any gambling into hedge funds or private equity funds, regulators imposed a cap on how much of said funds banks can own: no more than 3 percent of any individual hedge fund or private equity fund (called “covered funds” in the rule). There is also an aggregate cap: only 3 percent of a bank’s total assets can be spent investing in covered funds. Unfortunately, some problems that existed in the draft persist to the final rule. One problem has to do with the way bank employees that manage covered funds get paid. Private equity fund managers are often paid through “carried interest,” which allows a manager to share in the profits made by the fund. This kind of compensation is famous for its preferential tax treatment—typically private equity fund managers only pay 15 percent tax on this income. This is why Warren Buffett pays a lower percentage in taxes than his secretary. The main argument made in defense of carried interest is that it is an ownership interest, rather than standard wage-based income. According to William Dantzler, a partner at White & Case LLP—one of Wall Street’s favorite law firms—“carried interest is an ownership interest in a partnership that entitles the partner to a percentage of the profits.” One might expect that for consistency, carried interest would also be treated as an ownership interest in Volcker. But it isn’t. In the Volcker Rule, carried interest doesn’t count as an ownership interest—and doesn’t count towards the banks’ 3 percent limit. If the five regulators that wrote Volcker can all agree that carried interest is not an ownership interest, certainly Congress should be able to change the way the tax code treats this kind of compensation. If they don’t, the banks get to have their loophole and pay ultra-low taxes on it, too. Another issue is the business-development company exemption. A business-development company (BDC) is a type of Investment Company that is similar to a mutual fund. It has restrictions on how 70 percent of its funds are invested, but is allowed to invest up to 30 percent of its money however it likes—including investing in hedge funds or private equity funds. BDCs are exempted from the Volcker Rule’s restrictions, unless the bank owns 25 percent or more of a voting interest in the BDC. This is unfortunate, because allowing banks to invest up to 24 percent in a fund that can then invest 30 percent of its money in covered funds seems to completely subvert the intent of the rule’s 3 percent limit on covered fund ownership. These concerns are underscored by a WSJ report that Goldman Sachs has created a new BDC in order to invest in (and ostensibly gamble with) high-risk debt. To make matters worse, House Republicans are trying to deregulate BDCs to allow them to make more investments in private equity and hedge funds, an effort that Mary Jo White opposed. If ongoing efforts to deregulate BDCs aren’t stopped, it will open up a substantial way to sidestep the rule. The policies, procedures and limits mandated by this rule are mostly left for individual banks to craft on their own—regulators did not provide strict guidance on what they should look like. This is akin to allowing students to choose their own grading systems. This has gone very wrong in the past: banks’ own policies insisted they obtain all needed documentation before pushing a family into foreclosure—and yet those guidelines were either inadequate or routinely violated. The regulators are to be lauded—loudly—for getting this job done. But despite what the Obama Administration may argue, neither the Volcker Rule, nor any other part of Dodd-Frank, should be considered a panacea; it’s simply an important beginning. Prior to 2008, we didn’t have a meaningful pro-reform infrastructure: there was no Americans for Financial Reform, no Better Markets, no “Occupy the SEC,” and deregulation reigned. But the world has changed: Elizabeth Warren gets millions of views on YouTube when she asks regulators tough questions. The American public doesn’t think the fight is over, and they’re right. There are an immense number of remaining problems that Volcker did not solve; and there are areas of the “shadow banking” system that Dodd-Frank didn’t even touch, as Federal Reserve governor Daniel Tarullo discussed in a recent speech. 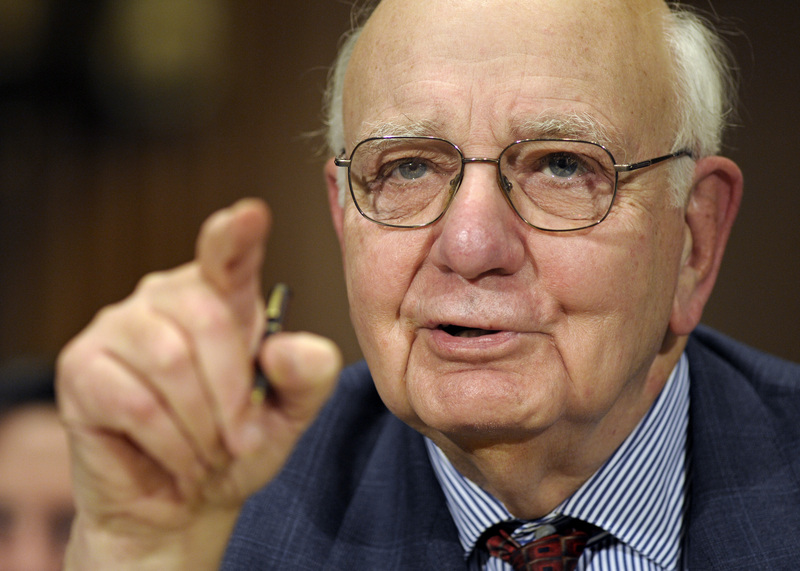 The Volcker Rule is an important step that must be defended and properly enforced. But we can’t stop here. The financial industry and its lobbyists are not going to rest—in fact, financial groups have sued the CFTC five times in the last two years, and, as highlighted by Zoë Carpenter for TheNation.com, we can certainly expect lawsuits on Volcker. Lawmakers and reformers need to be just as bold and persistent as these Wall Street groups. If we’re not, the status quo of banking will be maintained, and America’s legacy on financial reform will be little more than hollow PR. Alexis GoldsteinTwitterAlexis Goldstein is a former Wall Street professional and currently serves as the Communications Director for The Other 98%.